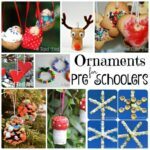 We really do have a “thing” about DIY Christmas Ornaments for Kids! 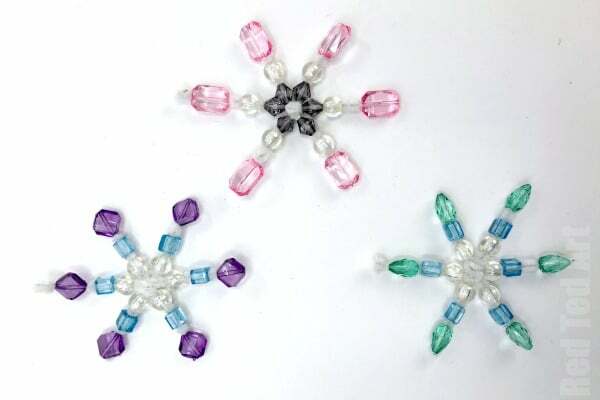 Especially when they are as pretty as these Beaded Pipecleaner Snowflakes. These easy pipecleaner snowflakes will be much loved by both preschoolers AND older kids.. in fact, I think they are pretty enough for grown ups to make. 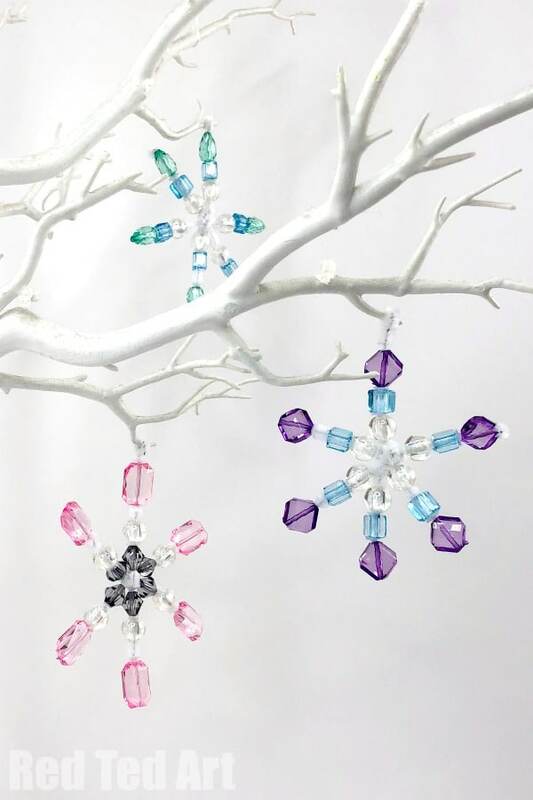 Though we have designed and made them as a Christmas Tree Ornament, I think these beaded pipe cleaner snowflakes would look stunning hanging in your windows too and catching that Winter Sun!! Who says winter has to be “boring and dull” once Christmas has passed? So don’t just make these as your Christmas Ornaments this year… but once they come off your Christmas tree, hang themin your windows as Winter Decorations too!! 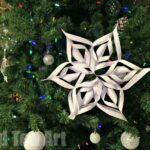 Hooray for Snowflake Crafts for Kids! Teachers: this is also a fantastic craft for developing fine motor skills whilst making keepsakes for the children to take home to family! We used white pipec cleaners – white for snow.. but light blue or silver would be gorgeous too!! 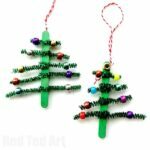 We used some beads in our “Kids Made Modern Bead” kit that were perfect. But any transparent bead will do! If hanging in your window – fishing line wire is great (US / UK)! 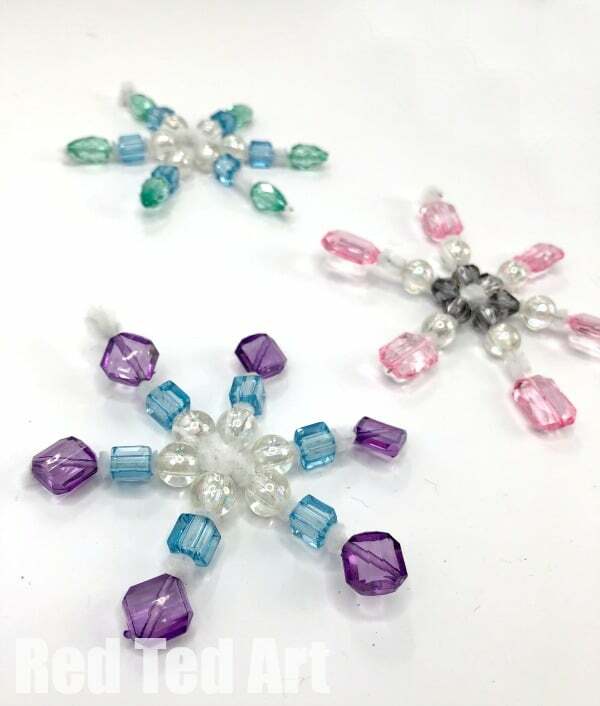 We have put our favourite Beaded Pipecleaner Snowflake materials in our Amazon Affiliate shop for you here: Ornaments 101 Amazon Shop. 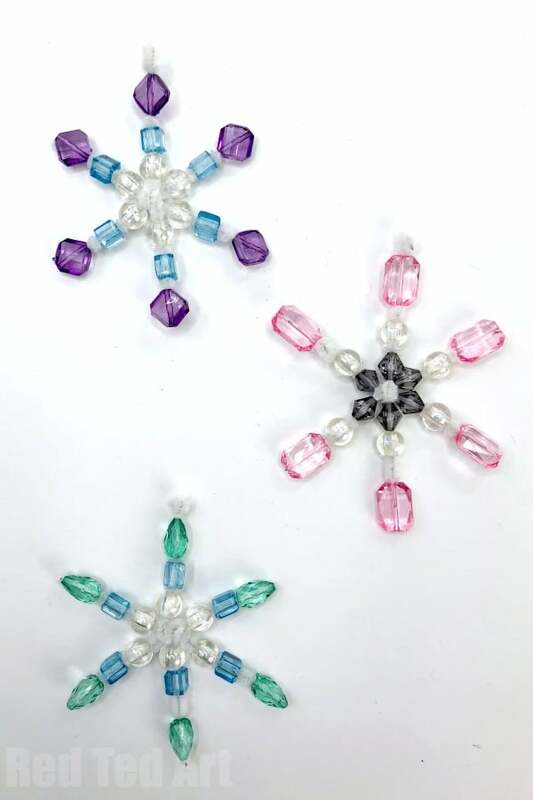 How to make pipe cleaner snowflakes with beads – video instructions first.. with our step by step instructions for these Snowflake Ornaments below! Choose the medium you prefer! 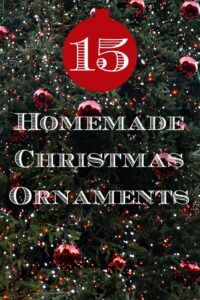 Remember you can find all the materials needed here Ornaments 101 Amazon Shop! 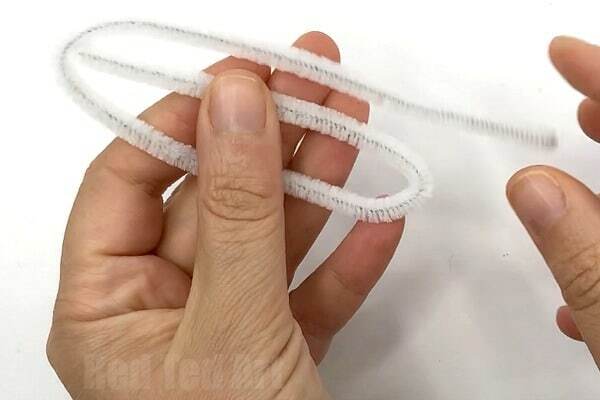 Most people like to cut their pipecleaner into three equal parts approx 10cm.. however, WE like to cut them into roughly 9.5cm, 9.5cm and 11cm – that gives you one longer pipecleaner for “twisting” and hanging. Fold the two shorter pieces in half. 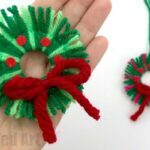 Now twist the longer pipecleaner around the middle of your snowflake diy – so you have 5 parts of your snowflake the same length and one slightly longer one. Make sure it is a nice neat twist. 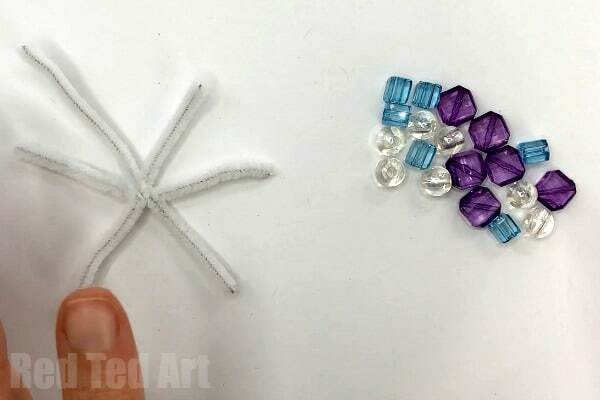 Thread your transparent beads onto your white pipecleaner snowflake. I like to put a small bead as close to the centre, then a one or two other beads and a large one at the end. 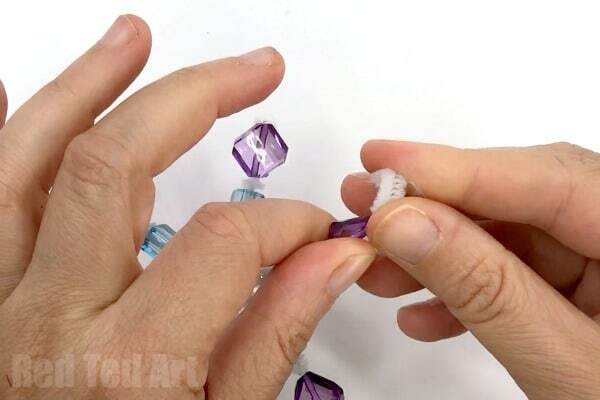 Depending on your beads, you can either just leave them or glue the large bead in place. When you come to your longest piece of pipecleaner, make sure you bead goes along far enough for a little of the pipecleaner to poke out. Twist that into a loop and use that loop for hanging in your tree or onto your fishing wire! Your Beaded Pipe Cleaner Snowflake is done!! Hooray! 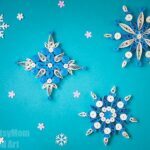 As well as our gorgeous and oh so pretty Snowflake Crafts for Kids! I like that you make a written and video version! that must take a lot of time! I prefer video versions, but it is nice to have both. This is one of my favourite crafts from you- just so so pretty! Love this snowflake idea. 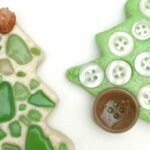 I work with the elderly and I am always looking for easy craft ideas. 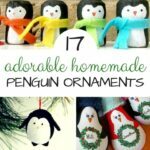 I love these crafts! They are soo easy and cool.